1. 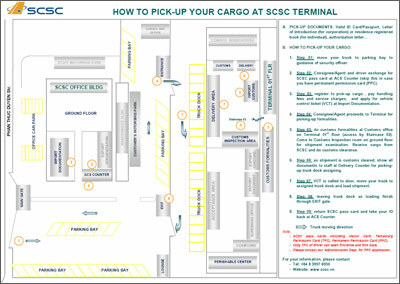 Move to the truck parking area in front of the cargo terminal. 2. Provide driver identity, vehicle details and shipment data by Shipper Instruction for Dispatch (SID) in order to obtain a Vehicle Control Ticket (VCT ticket) and a security pass card at the Landside Export Counter. 3. Check the electronic screen at driver waiting lounge for VCT number and door number. Show VCT and pass SCSC terminal control gate. 4. Proceed to called door and deliver freight for acceptance. Leave door once unloading is complete. 5. 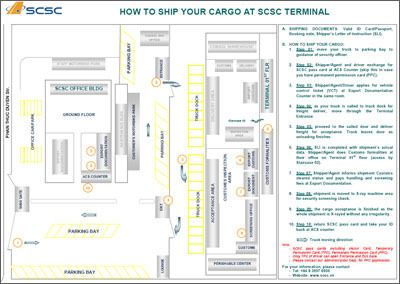 Complete SID with actual shipment data checked and signed by SCSC authorized personnel. 6. Shipment moved to customs inspection area, and undergoes customs clearance. 7. Submit SID to the Export Document Counter and pay handling charges and any additional fees due. 8. Finally the whole shipment is X-rayed and given full clearance provided the X-ray is found to be without irregularity.